Tekken: Dark Resurrection was not only the best fighter to ever hit the Playstation Portable, it is still considered one of the top games to hit Sony's portable. The arrival of Tekken 6 on the PSP could only mean great things, right? Graphics: The PSP version of Tekken 6 is a surprisingly attractive game. The portable version does cut a few corners, for instance there's no option to turn on blur, but overall it's a sharply detailed game. Controls: With four face buttons and two shoulder buttons and a snappy directional pad, the PSP is a perfect match for the Tekken series. Each face button controls a limb of your fighter and the heavy reliance on single direction controls for special moves makes pulling off attacks on the PSP a breeze. Responsiveness: There's no stutter, no lag here when playing the game. Controls and the fighters are smooth and responsive, making taking Tekken 6 on the go a joy. No Filler: The PSP version of Tekken 6 doesn't include that annoying, seemingly never ending Scenario Campaign that bloated the console versions of the game. Everything you find in this version of the game you'll want to do. Faster Load Times: My other chief complaint about the console version has also been fixed in the portable version. The load times, especially if you pre-load the game onto a Memory Stick, are lighting fast. I experienced almost no wait while working through the single-player story lines and arcade mode of the game. Mappable Buttons: It may seem like a minor thing, a no brainer. But it's nice that the developers allow you to map all of the buttons on your PSP to whatever controls you want. That way you can make use of the shoulder buttons or ignore them. Your choice. Stories: While cutting the scenario campaign from the portable version of Tekken 6 was the right move, it would have been nice if the team spent some of that extra time on beefing up the character's cartoon story lines. No Online Multiplayer: Dark Resurrection's lack of true online multiplayer was, perhaps, forgivable, but why doesn't Tekken 6 have it? Worse still, while the ability to save and share ghosts of your fighting style with other players to use as AI is still in the game, that data can no longer be uploaded or downloaded online. All ghost data, as with multiplayer matches, can only be shared via a local connection. No Replay: It's nice to be able to check out your finishing move after playing a difficult match in Tekken, and there are plenty of them. Unfortunately, the PSP version trimmed this feature from the game for some reason. Tekken 6 is a fantastic game, one that improves the graphics and playability of the fighting franchise for the portable. What it tragically doesn't do is push the envelope in anyway to extend the reach of multiplayer gaming for the franchise. In fact, it actually cuts down on the ways the game can deliver more lasting fun. While the game will be a must-have for fans of the franchise, it still disappoints on that key issue. 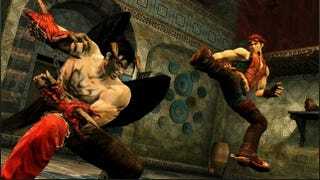 Tekken 6 was developed and published by Namco Bandai for the Playstation Portable on Nov. 24. Retails for $39.99 USD. A download code for the game was given to us by the publisher for reviewing purposes. Played multiple arcade, story, ghost and challenge matches.